Welcome to my page o'stuff. By stuff I truly mean stuff. This is mostly random things that I feel like publishing on my web site. The format and content will change from time to time based on what I want to do with my page and how much free time I have. I've been playing with data compression for a while and the results have become a large part of my stuff. I hope some of this stuff may actually be of use to you. Earlier versions of this page (some time in 2000 through November 2008) had a picture of me with my dogs Spike and Penny. Spike died in August 2008 and Penny died in 2010. Looking at them in the picture got to be a little difficult. Not that it's easy to look at any picture with me in it. 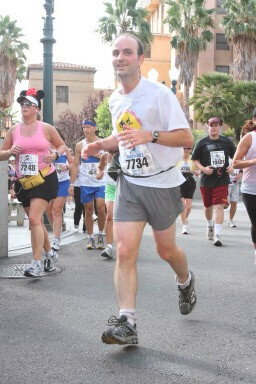 For those of you that insist my web page would not be complete without a picture of me, I've replaced that picture with one from the 2008 Disneyland Half Marathon. It was my first half marathon. I ran it with a group of people (not in the photo) to raise money for the Diabetes Explorer Education Foundation. Check out their website for more information. I've run a bunch of half marathons and marathons since the one in the photo. There are photos of me from every one of those runs, but all of the other photos have me with distorted facial expressions. If you think the picture above is bad, you should see the others. If you have any questions or nothing better to do, feel free to e-mail me at mdipper@alumni.engr.ucsb.edu. Who knows, maybe your e-mail will become part of my stuff.